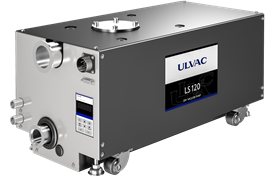 The new LS series from ULVAC Technologies has four pumping speeds. US vacuum technology specialists ULVAC Technologies has announced the launch of its LS series of dry screw pumps. The ULVAC LS series has four pumping speeds from 120 to 1,000 m3/h and the company says the pumps provide a high pumping speed, compact size and low power consumption. The LS pump features a pair of conical shaped, variable pitch, deeply machined steel screws which means that the pump is one third shorter in length and one third lighter in weight than other screw pumps in the same pumping speed class. This advanced screw design also increases the pumping speed near atmospheric pressure, which allows the LS pump to cut its downtime by 20% while using less power. Power consumption is no more than 0.6 kW once it reaches ultimate pressure. A built-in silencer reduces the noise level to not more than 61 dB(a). The lighter weight and smaller size of the LS series pumps means they are designed for straightforward retrofits and repair costs are around 50% less than a typical multi-stage Roots dry pump. Designed for small dosing applications.